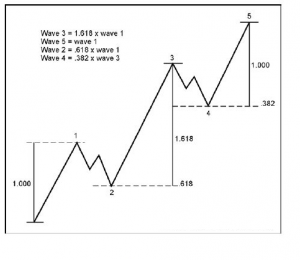 In Elliot wave analysis, Fibonacci ratios may be an invaluable aid in your road to winning trades. 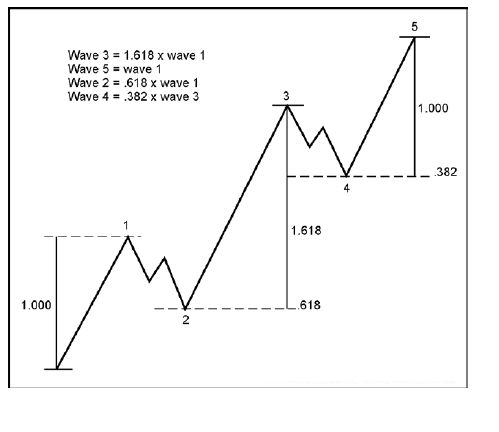 Many traders think that they have mastered Fibonacci technique so they know the Elliot wave principle also. Totally wrong. One should know the wave personality before applying Fibonacci ratios. It may sometimes rewarding to use Fibonacci technique alone but the rewards may depend more on chance. We will not waste our time describing the relationships of Fibonacci ratios with nature. Many would have read about the relations with nature and those who have not, can Google it. We will describe the practical application on charts. There are seven to eight main ratios that appear again and again in practical life. These are 23.6%, 38.2%, 50%, 61.8%, 100%, 123.6%, 138.2% and 161.8%. All the ratios up till 100% are used to measure corrections. And, above 100% are used for projections of Wave 3 or Wave C in A-B-C correction. Wave 2 can come maximum to the low of Wave 1 in 5-wave sequence i.e. Wave 2 retraced 100% of Wave 1. A 100% retracement is also known as double bottom to many. Very commonly, it is seen that Wave 2 retrace 50% of Wave 1 and there are many instances where it retraces up to 61.8% of Wave 1 also. When we are comfortable with the retracement or correction in Wave 2 has ended we can look to buy at 50 to 61.8% retracement. Wave 3 generally travels minimum of 100% of Wave 1. Wave 3 has the personality of travelling to 161.8% of Wave 1 most of the times. Any 3rd wave which doesn’t travel beyond 161.8% of wave 1 will is said to be “normal”. A move beyond 161.8% can be said that Wave 3 is extending so mind can be changed for further targets. Generally extensions can end anywhere but may end at 200%, 261.8%, 300% or 461.8%. Elliot mentioned that one of 3 motive waves will extend and in stock markets most of the times Wave 3 extends and Wave 5 in case of commodities. It is a general observation so should not be assumed as a rule. When Wave 3 ends, wave 4 typically corrects 38.2% of wave 3. The next most likely retracement level is 50%. When the third wave has extended, it is more likely the correction will be shorter, and there is a tendency for Wave 4 to finish at the 23.6% retracement level. After the Wave 4 retracement, the target projections or termination level of Wave 5 comes. There is rule that if Wave 3 extends Wave 5 generally equates Wave 1. Even the 38.2% and 61.8% of the distance from Wave 1 to Wave 3 is computed and added to the low of Wave 4. There are end numbers of examples in real life which tells us about these relationships.